One of Lake Michigan’s tastiest and lesser known fish is finally getting a little attention in the badger state, where South Dakota fishermen Ray Stromsness boated the new state-record Whitefish. 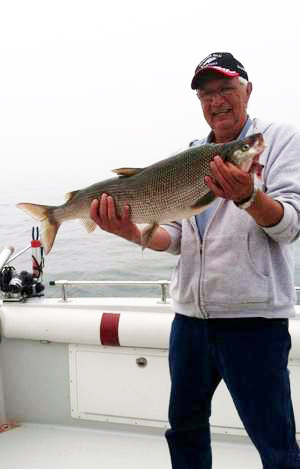 Stromsness was fishing in Lake Michigan aboard Dumper Dan Sportfishing Charters when he caught and landed a 12 pound 4 ounce lake Whitefish by dropping a spoon 30-feet down in the Lake Michigan waters on July 9. Stromsness beat the old record handily, which has been held since 1977 at 11 pounds, 11 ounces. Currently the World Record whitefish stands at 14 pounds, but this South Dakota angler has Wisconsin’s state-record in hand. Whitefish are a popular and tasty fish in Wisconsin and many fisherman regularly seek them out for fish frys and fish boils. Fish boils are a popular event in Wisconsin, especially in Door County and serve traditional whitefish. Photo courtesy of Dumper Dan Sportfishing Charters and the Milwaukee Journal Sentinel.